And just like that, another Swede Fest is behind us. You helped us pack The Tower Theatre with almost 400 people to watch 28 awesome sweded films. If you couldn’t make it or just want to relive the magic, you can check out all the entries right here. We’d like to thank everyone who submitted because without you, this festival would simply not exist! 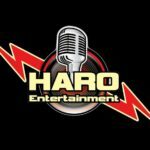 We’d also like to thank our sponsors that make Swede Fest possible. FresYes.com / FresYes Realty, CMAC, Fresno Filmworks, The Tower Theatre, Haro Entertainment: thank you so much. Our volunteers: without you, the event would not run so smoothly so thanks to Matt, Juan, Kyle, Bee, Thong, Natalie and Valerie. If you are interested in volunteering and helping Swede Fest become cooler, please drop us an email at info@swedefest.com and we’ll get in touch. Thanks again and be sure to start thinking about YOUR entry for Swede Fest 19, coming in winter 2019. Read more "Swede Fest 18 wrap-up"
Swede Fest 18 is coming up on Sunday, December 2 and will be returning to The Tower Theatre. Doors open at 5pm, films start at 5:30pm. You know what that means? It’s time to start turning your gears to generate some swede-tastically awesome ideas! Grab your friends and family, browse your Bluray or Netflix library, start collecting cardboard boxes from your nearest dumpster, because before you know it Swede Fest 18 will be upon us! The deadline for entries is Monday, November 26 at 11:59pm, but there’s no time like the present to start your creative process. Don’t be shy about turning in your entry early! Time limit is still 4 minutes and your entry must be suitable for all ages. It’s free to submit and everyone of all ages is encouraged to swede their favorite films. Although it’s not required, we like to hear from people who are planning to submit so we can start planning out the program. So if you are going to create one, drop us an email at info@swedefest.com to give us a heads up! If you need some inspiration, feel free to visit our library of past entries right here and the ideas will be flowing in no time! If you have any questions, please email us at info@swedefest.com. Happy sweding! Read more "Call for entries for Swede Fest 18, festival set for December 2"
And just like that, another Swede Fest is behind us. You helped us pack The Tower Theatre with almost 400 people to watch 34 awesome sweded films. If you didn’t make it or just want to relive the magic, you can check out all the entries right here. We’d like to thank everyone who submitted because without you, this festival would simply not exist! We’d also like to thank our sponsors that make Swede Fest possible. FresYes.com / FresYes Realty, CMAC, Fresno Filmworks, The Tower Theatre, Haro Entertainment: thank you so much. Our volunteers: without you, the event would not run so smoothly so thanks to Matt, Kyle, Thong, and Bee. If you are interested in volunteering and helping Swede Fest become cooler, please drop us an email at info@swedefest.com and we’ll get in touch. Thanks again and be sure to start thinking about YOUR entry for Swede Fest 18, coming in 2018. Read more "Swede Fest 17 wrap-up"
Swede Fest 17 is coming up on Sunday, December 10 and will be returning to The Tower Theatre so you know what that means: it’s time for the gears in your head to start turning to generate some swede-tastically awesome ideas! Grab your friends and family, browse your DVD or Netflix library, start collecting cardboard boxes from your nearest dumpster, because before you know it Swede Fest 17 will be upon us! The deadline for entries is Monday, December 4 at 11:59 p.m but there’s no time like the present to start your creative process. Don’t be shy about turning in your entry early! Time limit is still 4 minutes and your entry must be suitable for all ages. It’s free to submit and everyone of all ages is encouraged to swede their favorite films. Although it’s not required, we like to hear from people who are planning to submit so we can start planning out the program. So if you are going to create one, drop us an email at info@swedefest.com to give us a heads up! If you need some inspiration, feel free to visit our library of past entries right here and the ideas will be flowing in no time! If you have any questions, please email us at info@swedefest.com. Happy sweding! 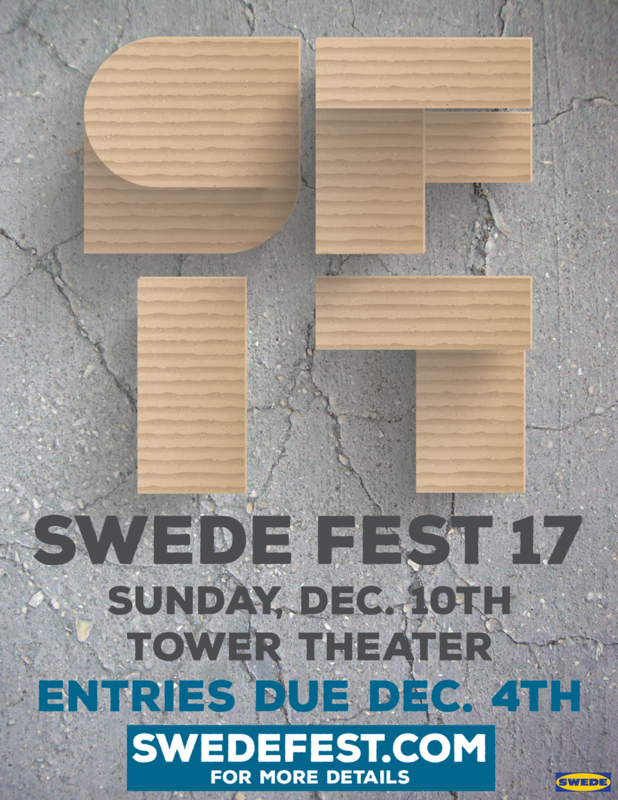 Read more "Call for entries for Swede Fest 17, festival set for December 10"
Swede Fest is a film festival for sweded films! A sweded film is a low-budget, summarized, recreation of a popular Hollywood movie or TV show. Sign up below to receive all the latest Swede Fest news.